I'm an illustrator and designer who strives to create fun and quirky artwork that connects with its audience and puts a smile on its face. My pieces combine a retro sensibility and a dash of cute, and I always aim for direct, unique, and memorable communication with the viewer. I've worked in advertising and design for many years, creating work in the confectionery, stationery, theatrical, and beauty industries. 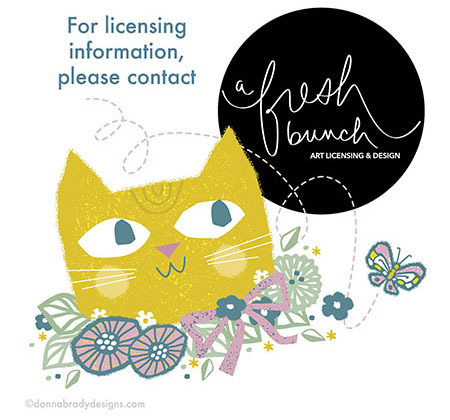 Currently, I am represented by A Fresh Bunch, and they have licensed my work for products such as greeting cards, wrapping paper, gift bags, tableware, and wall art. It's a dream come true! I'm inspired by the work of Mary Blair, Tammis Keefe, Roger Duvoisin and Abner Graboff. Anything mid-century is my cup of tea (though I prefer coffee). I'm a gardener, a dog lover, and a fan of theatre, classic movies. and groovy lounge tunes.